The remarkable spiraling structure of the Guggenheim Museum compels museumgoers to experience art along an upwards, evolving pathway. In “Hilma af Klint: Paintings for the Future,” exhibit and environment intertwine as af Klint’s revolutionary pieces evolve right along with us. At the bottom of the museum, viewers may disparage the “girliness” of af Klint’s earliest works. The soft pastels, swirling patterns, and motifs of butterflies, snails, and rainbows in “Ten Largest,” may call to mind children’s doodles proudly pinned on refrigerators. However, this reductionist “girly” viewing stems from a male-dominated history of abstract art. The straight-edged, bright, primary colors of Mondrian, moody swatches of Rothko, harsh brushstrokes of de Kooning, and ejaculatory splattering of Pollock all assert themselves on their canvas in decidedly unfeminine ventures into the abstract. In contrast to this stormy, typified canon, af Klint’s delicate strokes seem juvenile, simple, unassuming. But the themes of motherhood and creation in her wombed loops reflect another kind of nascence: the genesis of abstract art itself. Af Klint created her first abstract painting in 1906. This remarkably early start predates that of Wassily Kadinsky, who has long held the status of being the original abstract artist. 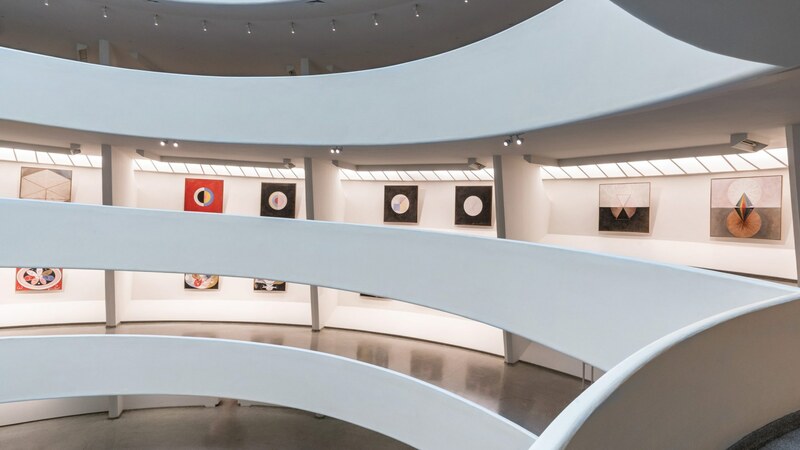 The Guggenheim Museum even permanently houses some of Kadinsky’s work as a testament to his acclaim as a pioneer. In contrast, af Klint never even had a gallery showing, ordering in her will that her paintings shouldn’t be shown to anyone until 20 years after her death. 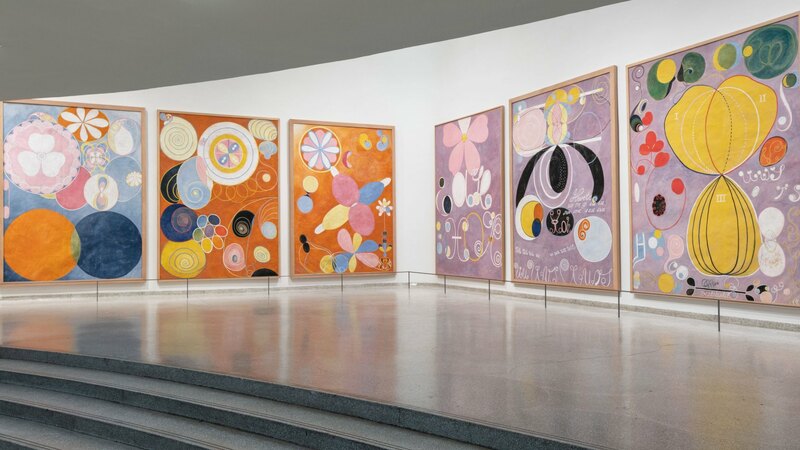 Truly, as the exhibition title suggests, these paintings were “for the future.” Cognizant of how ahead of her time she was, af Klint prepared for a point in which people would be able to appreciate her work without disrupting her spiritualism, allowing us the unique opportunity to experience her entire journey as a unified collection. Wall after wall of paintings, notebooks, and sketches make af Klint seem like one possessed — and in fact –– she believed she was. 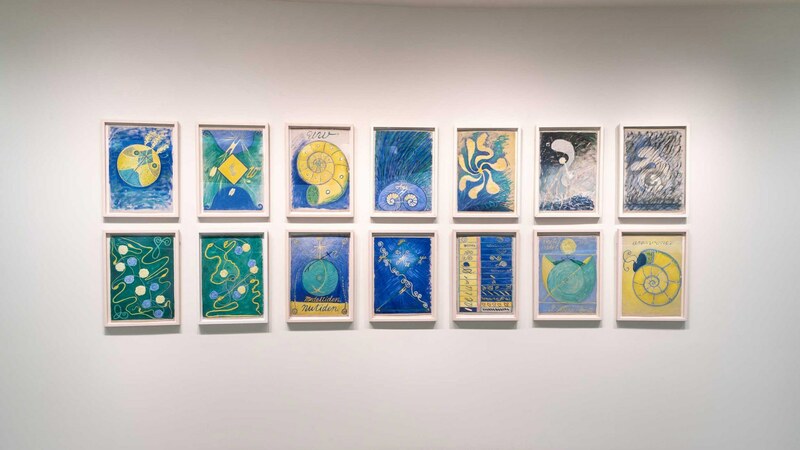 As the turn of the twentieth century brought both scientific discoveries and religious fervor, many consolidated the two in Western esotericism, and af Klint was no exception. A strong believer in theosophy and the occult, the artist held séances with other women, in which she believed spirits contacted her. It is through these spirits that she found her inspiration for her art. The rampant dichotomies in her watercolors — masculine and feminine, earth and heaven, body and spirit, biological and geometric — parallel the mix of symbolism and science of theosophy, which promotes unifications and the discovery of the absolute. In fact, many of her presumed squiggles of eggs, petals, and worms correspond to specific words and phrases that she denotes in her notebooks. Even without knowing this detailed planning, the value of her works as non-concrete images remains. 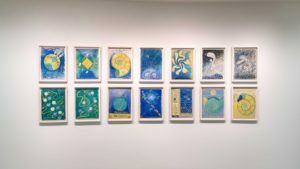 While critics may use her spiritual inspiration to downplay af Klint’s originality, her theosophical commitment actually reinforces her importance as a theorist. Af Klint uncovered her own theosophical absolute in the new universal language of abstract art, able to hibernate until over a hundred years later, unifying her time with ours. This timeless quality is exemplified by the final collection of the exhibit, which is not by af Klint at all. Contemporary artist R.H. Quaytman perused af Klint’s thousands — yes, thousands — of notebooks. Taking artistic liberties, Quaytman created the collection “+x, Chapter 34.” Klint often uses “+x” in her notebooks, encapsulating the theosophic exchange between spiritualism and science, as mathematical characters connote the addition of the unknown while retaining the figurative meaning of two crosses. The motif — both + and x — is repurposed from the crucifix of Christianity into a geometric tool of separation, symbolizing the division of the human experiment. 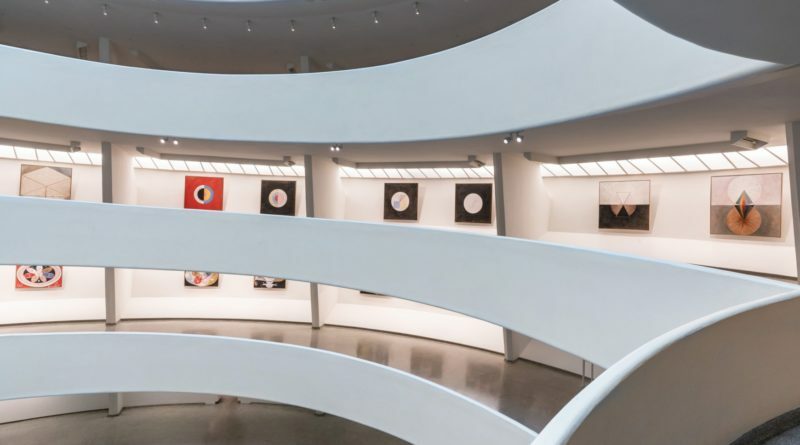 The Guggenheim, too, is divided into sections, and Quaytman used each section to represent a page of this book, each slight variations on a theme. All are punctuated by a white circle on a black square, reminiscent of the moon. In each section, these circles occupy slightly lower positions in each section, which looking from the very top of the museum, has the effect of the moon slowly fading down in the sky: the final combination of geometry and nature coming to an end along with the life of af Klint and her giant volume of work. On my way back down, I felt a strange sadness, as if I was Benjamin Button, or watching a life in reverse. The rudimentary depictions from the start of the show unveil this pain of birth and motherhood: that of the miniscule — tiny bacterium and snails, or even particles like in “Atom Series”; that of the impossibly large — the creation of matter from light, the Tree of Knowledge; but mostly that of af Klint herself, whose private birth of work corresponded to a huge worldwide movement of abstract art.